The Book Doctors first met Cathy Camper at a Pitchapalooza (think American Idol for Books) at one of our favorite book stores, Powell’s in Portland, Oregon. 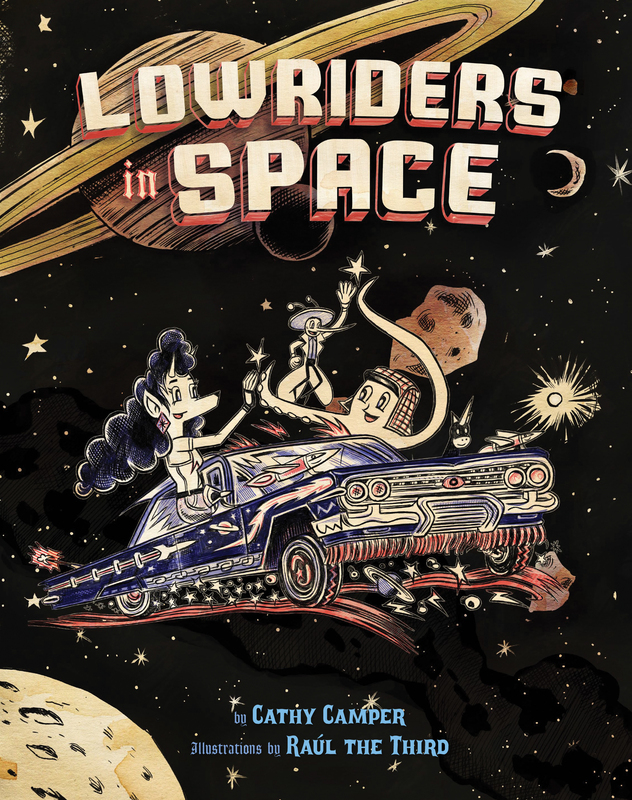 As soon as she pitched us her graphic novel, Low Riders in Outer Space”, we knew this was a great book waiting to happen. And now it has. So we thought we’d pick her brain on what it was like to go from talented amateur to professionally published author. The Book Doctors: Did being a librarian influence your writing & your approach to publication? Cathy Camper: In 2006, I moved to Portland, OR and was working as a youth services outreach librarian. I’d bring books to schools and I got really angry. I was seeing diverse groups of kids, but all the books were about white suburban children. As an Arab-American, I know what it’s like not to see yourself in books. 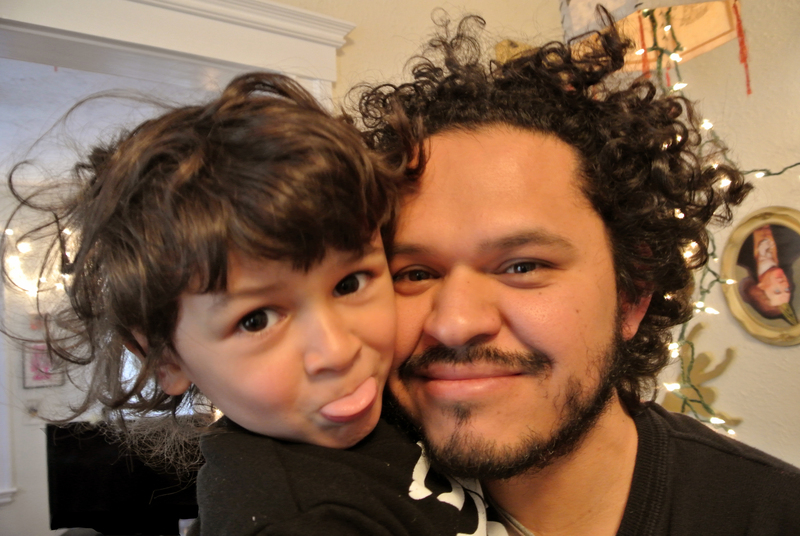 Plus, so many books that feature kids of color are old, or not written for the world kids live in today, but for the past, their parents’ world. The 2050 census says one third of the U.S. will be English-Spanish speaking households – that’s our audience! I also wanted a book for boys, since boys literacy rate is dropping. And I love science, and there’s a big push to get more science in school curriculums. I aimed my book and my pitch at these big audiences, and told publishers why it they were important. TBD: Tell us about your long & winding road to publication. CC: First I wrote the book, from 2006 to 2009. Then I emailed Raul Gonzalez, the artist, who was working as a fine artist, and asked if he’d ever considered doing a kids’ book? He said, yes, and so I sent him the script. He wrote back, “This is the book I wanted to read as a kid, “ and within days, he was sending me sketches of the characters. It was just plain luck that we were so well matched; we have a similar sense of humor, similar sensibilities and the same work ethic. We put together a pitch. I found lists of agents who repped graphic novels online, and sent it out as cold calls. It was right as the recession was hitting, and no one wanted it. On the plus side, people loved the art and writing, so I knew that wasn’t the issue…but I’d hear things like “too marginal an audience,” or “not quite right (white enough?) for our audience.” Also I got lots of warnings that bringing in my own artist would be a problem; though it’s common in the world of comics, it’s not done in the children’s book world. I reached the end of the list of agents, and was lying awake nights wondering what to do. Then I heard about the Book Doctors Pitchapalooza. It’s funny, but I never realized there was a prize, or maybe I thought you just won a free copy of a book or something. I entered thinking, wow, I can test how good my pitch really is, because I didn’t know the judges, the audience, no one. Ironically, the day I did my pitch, I’d just done book talks as a librarian for six classes. So I thought, why not do it for my own book? It wasn’t until the judges were actually conferring that it occurred to me I might actually win. The Book Doctors were the ones who connected the book to Chronicle Books and to our agent Jennifer Laughran. They made it happen. I think all publishing is like this – part talent, part hard work, and part luck. All creators can control is honing the talent and doing the work. But it’s important to do, because when luck comes your way, you want to be ready. TBD: Why did u decide to do a graphic novel? CC: Actually the book could have been a picture book, or a floppy comic, but graphic novels felt like the best fit, so I tried that first. I love comics- how both text and pictures tell the story. Plus graphic novels are hot! When graphic novels first came out, libraries and books stores didn’t know what to do with them. But now there are so many good graphic novels for kids, and they’ve become so popular, I think they’re figuring it out. Both Raul and I love comics and the flexibility they allow – it’s like making a movie where anything can happen – on a budget of Bic pens! TBD: What were some of the joys and challenges of blending your words with an artist’s images? CC: When I start writing the script, I have to be very descriptive in the sense that the script is all there is for the artist, editors and art director to work with. So I work very hard to build a world, characters and pictures in their minds. When Raul draws the thumbnails, a lot of the words I’ve written (not just dialog, but description, innuendo, expressions etc.) are now part of the illustrations, and there’s no need to have them in the text. So lots of text gets cut because it’s redundant when the art is there. Raul and I were lucky that we had great freedom to riff off of each other’s ideas, like jazz musicians, and to take as many pages as we needed to make it work. On the downside, we sometimes struggled with not being able to work together in the same place, at the same time…email and different time zones create extra hurdles when you have unwieldy edits to do. TBD: From the first we heard your title Low Rides in Outer Space we loved it. How’d you come up with it? CC: I don’t remember the exact moment it hit me, but it was very early on. I think it was a natural extension of the concept, which was that these characters would have a lowrider that got detailed by outer space. It’s only recently that a friend pointed out the cool little twist inherent in the title, the idea of a car designed to go low – that blasts into the highest place there is – space!! TBD: How did you come up with the idea for the book? CC: Daydreams. I’m a prolific daydreamer, and all my books start with stories I tell myself. That’s how the story came about. I also noted as a librarian that books on lowriders were super popular, but we only had three or four of them for kids, all nonfiction. I tried to find a book like mine, but when I saw it didn’t exist I thought, well, I’ll have to try to write it myself. TBD: There’s been a lot of talk about diversity in publishing. What’s your take on that? CC: We need more diverse kids books, and I’m so glad there’s pressure to change things. At Multnomah County Library where I work, we recently made a booklist of good picture books for African American kids. There wasn’t one set on the West Coast – from these books you’d think African Americans only live in brownstones in Brooklyn! Way too many were dire historical stories about slavery or hard times – where are the books about kids of color building forts, playing make believe, just doing things that kids do? We need this book primarily so kids of color see themselves in books, but also so white culture isn’t always primary. If a book is about a generic kid, why is that kid always white? It’s important that white readers see kids of color too. I sometimes joke – when a book like Diary of a Wimpy Kid is about a girl wearing hijab – you’ll know things are changing! CC: On my Arab side, my dad and uncle were writers, and so I grew up with the idea that writing was cool, something I’d want to do. So I’ve been writing since I was a kid. I carried a notebook around, took classes, went to conferences, was involved in writing groups and recently participated in VONA/VOICES writing workshops for people of color. But it was always self-driven, I never got an MFA, in part because I think it changes a writers voice, and also because, as Junot Diaz recently pointed out, MFA programs aren’t that supportive of writers of color. TBD: What’s your advice for writers, both as a writer & a librarian? CC: One crucial tip I’ll pass on is that so much of the quirky DIY stuff I did for many years for free ended up being what led to this book. For example, for decades I’ve written reviews of books for School Library Journal, Kirkus and Lambda Literary. I’ve also written and published zines and supported them as a zine librarian. I didn’t see it until now, but those things not only honed my writing skills, they created two huge support networks of people who knew my work. The adventures I’ve had and the people I’ve met via DIY vs. mainstream connections are equal. Don’t underestimate the value of what you do just because it’s not mainstream. TBD: Has Robert Rodriguez called yet? Cathy Camper is the creator of Bugs Before Time: Prehistoric Insects and Their Relatives. Her work has also been featured in Simple Times: Crafts for Poor People, by Amy Sedaris, as well as in Wired, Cricket, Cicada, Primavera, Women’s Review of Books, Utne Reader, and Giant Robot. She is a graduate of VONA/Voices writing workshops for people of color in Berkeley, California. 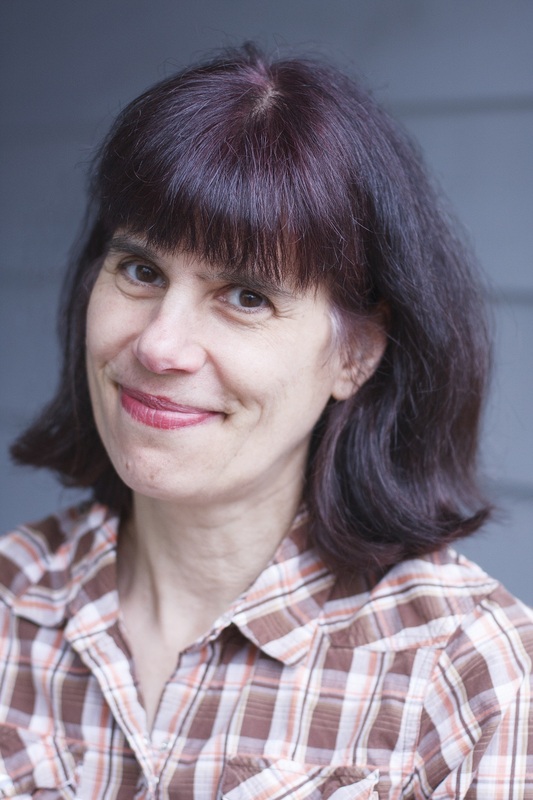 She reviews graphic novels online for Lambda Literary and is a librarian for Multnomah County Library in Portland, Oregon, where she does outreach to schools and kids in grades K-12. She lives in Portland, Oregon. Raúl the Third’s work is drawing much acclaim and was featured in four recent exhibits: The Community Arts Initiative at the Museum of Fine Arts, Boston; Carroll and Sons Art Gallery; the Fitchburg Art Museum; and his first solo museum exhibition at the Museum of Art, University of New Hampshire. He teaches classes on drawing and comics for kids at the Museum of Fine Arts, Boston; the Maud Morgan Arts community arts center in Cambridge; and Young Audiences of Massachusetts. Influenced by his youth in the border town of El Paso-Juarez, Raúl’s artwork recalls the old Mercado Cuauhtemoc and its many booths filled with old curiosities, etchings by José Guadalupe Posada, and the ballpoint pen–detailed fan art found in issues of Lowrider magazine. He lives in Boston, Massachusetts.